Adorning the front of this handcrafted, Spanish colonial style bench is a solid wood apron with curved, colonial style designs on its lower rim. The front apron has an exquisite, hand carved flower in its center, with hand carved, floral designs on either side. A multicolored leather braid runs through the entire top of the apron. 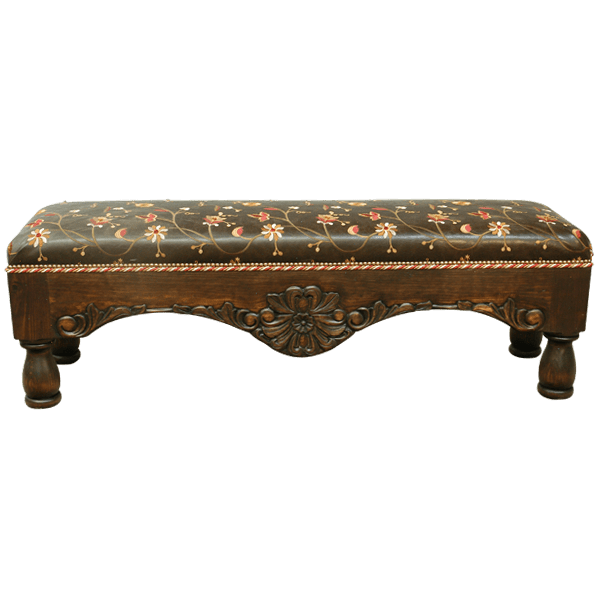 The comfortable, well padded, rectangular seat is upholstered with beautiful, black, patterned, full grain leather, with gorgeous, contrasting floral designs. The leather is precision hand tacked to the solid wood frame with beautiful, gilt nails. The bench is designed without a back, and it is supported by lovely, hand turned legs. It has an antique finish, and it is made with the best, sustainable, solid wood available. The bench is 100% customizable.